Information about this family and what exactly Mary’s husband Harold (Jim Mezon) has done is not shared quickly or directly, and there is a great deal of suspense surrounding their son Joey’s (Jonathon Young) disappearance. Harold’s past haunts him as he tries to protect his family and inflict as little damage as possible, while their son David (Dean Paul Gibson) is an entitled boor who nobody likes. Daughter Jane (Jenny Young) is bitter and devoid of emotion, and David’s wife Sherry (Jillian Fargey) copes incredibly well. The entire cast is rock solid, but Rose and Mezon’s emotional depth stands out as they come to terms with the past in order to accept the present and prepare for the future. The modular set pieces by Julie Fox that transformed easily from different bedrooms to building facades, to the interior of a downtown apartment evoked the starkly barren relationships of the characters. Similarly, Nancy Bryant’s costumes told us a lot about these characters’ social class. The projections and live film elements (Kevin Kerr, Brian Johnson, and Jamie Nesbitt) added to the richness of the story. Michael Walton’s lighting, Brian Linds’ sounds design, and compositions by Peter Allen set the right tone in each scene — many of which were ominous and sinister. While I loved the larger-than-life live film elements and the way they were integrated into the action, at times they seemed to overpower the action and upstage what was happening in front of us. There were a couple of moments when the projections distracted instead of adding to the scene, but for the most part they did enhance the narrative. Most of the transitions, despite involving moving large set pieces around, were smooth; but there were times when the changes pulled us out of the story momentarily or it was unclear for a few moments where we were. 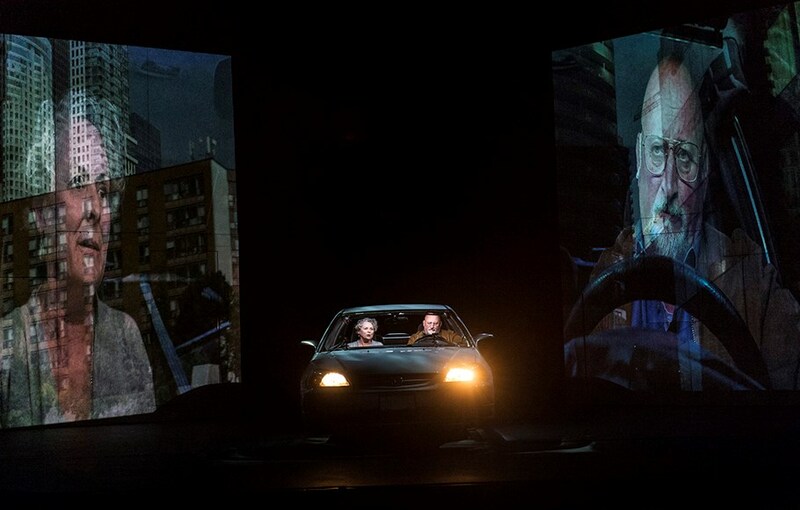 One of the most impressive set pieces, a full-sized car with working lights, was also a bit out of place as the older model sedan didn’t fit with the lifestyle of our wealthy protagonists. Writer Daniel Brooks says in his program notes that he began writing this as a screenplay and that makes a lot of sense considering the cinematic bravado of many scenes. Sometimes that enhances this production, and sometimes it adds to the abstracted, fragmented sense that sometimes crept in as I tried to piece together the various scenes and bits of information about this family. Brooks cites The Godfather, King Lear, and Marx brothers movies among his influences — it does feel like watching a mafia film crossed with a classic literary epic or Shakespearean tragedy. Director Kim Collier mentions that the play can inspire us to topple corrupt systems and revolt against the status quo — while I see how that applies to our matriarch Mary in a personal context as she fights against corruption and the system that took hold of her husband, I didn’t find a broader connection to everyday life immediately evident. Living the high life, these characters are not relatable to the average person and thus it becomes harder to equate their struggles with our own.